No other marketing channel can boast a 98% success rate. So whether your business is established or completely new, you can send out delivery notifications, appointment reminders, and personalised vouchers, directly to a customer’s smartphone. There are no contracts and our platform will always be completely free. You only pay for the credits you use. Credits cost just 3-5p depending on how many messages you send. So that means you can contact your top 100 customers right now for as little as £3! Join over 165,000 other UK businesses and try it for free today. Couldn’t be easier to get started. Haven’t tried any advanced features but the interface seems intuitive and easy to use. I’ve used Textlocal for a few years now and find it a quick way to promote my offers through SMS, so when I’m having a quiet period in my salon, I send the a quick offer using Textlocal. The online is easy to use and the response is better than leaflet distribution. Nice and easy to set up. I love the way I can import a thousand numbers from Excel or CSV and upload them. Prices are very reasonable. Keep up the good work!!! East Africa Air Cargo – 1st class service!!! 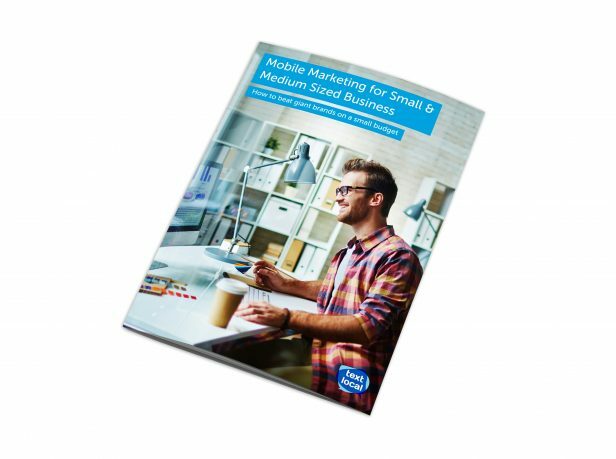 A guide to helping small and medium sized businesses compete on a smaller budget, using the latest research into the most popular and successful marketing methods.